(as in actually leaving the ground, both feet at the same time, and landing without falling over!) with excitement over Nora’s new “big girl” bedroom. As a reminder, this is what Nora’s room looked like when we first moved here (until last fall when we also crammed an armoire in there). 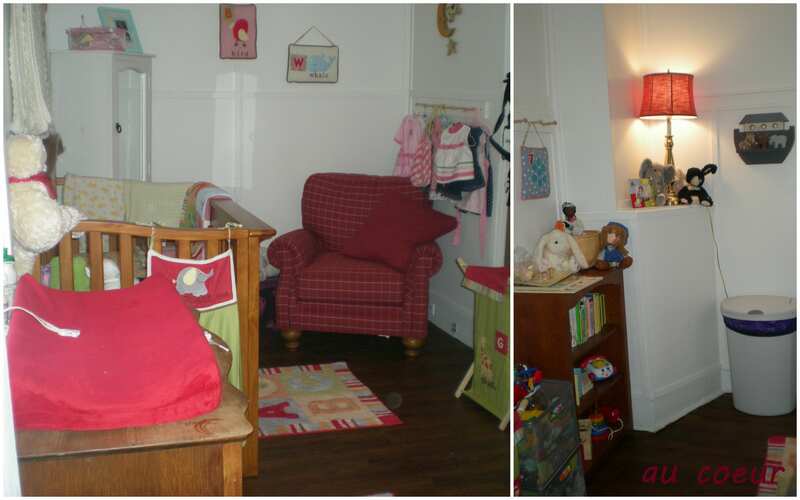 It was a lot of furniture in not a lot of space, so the first thing we did was get rid of the chair and the dresser we were using as a changing table, then move her crib to the back wall which opened up a lot more floor space for playing. Then came the fun of re-decorating. I stayed up late last night (really into this morning) to get it done, and I am giddy at how well it turned out (and how much can be changed in less than 24 hours). 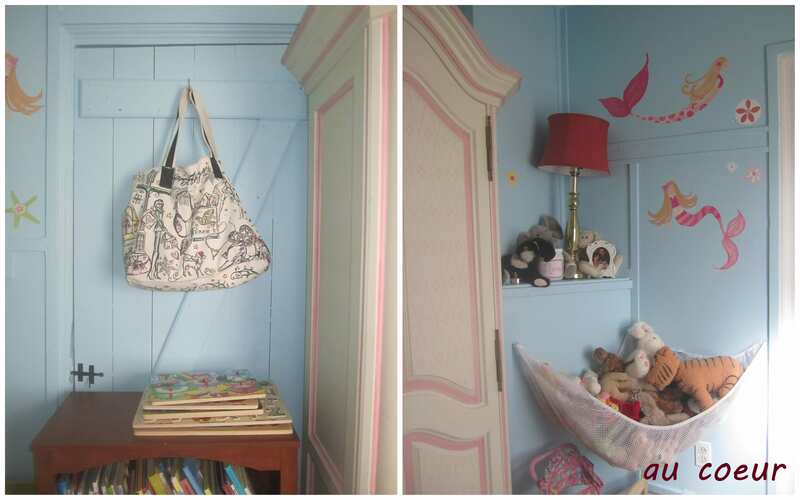 I decided to to go with blue paint to off-set the pink in her armoire and curtain (my amazing tag sale finds), plus I wanted something that could potentially be gender neutral if we have a boy and a girl in here someday. The paint alone made a huge difference her room. It’s a very small space (7ft wide by 11ft long; just big enough for twin bunk beds on that back wall — we’ve measured if you’re wondering). Mostly, her room felt like a box since it only has one window and everything was the exact same shade of flat white paint. It helps the space immensely to have the walls a different color from the ceiling and trim. I also decided to paint this door and trim the same color as the walls so they would blend in a little better. We don’t use this door (it has furniture in front of it on both sides — a casualty of our small house). It looks funny to have furniture in front of it, but I think it is a little less obvious now. I was most excited when I found these vinyl decals on Pottery Barn Kids. I obsessed over them (and everything else in this collection — have you seen my pinterest?). I love that they look semi-hand painted instead of obviously like stickers, but still have the flexibility of moving with us when/if we move in the future. I told myself it was cheaper than framing art. And, of course, nerdy me thought they seemed appropriate decor for a house 30 miles out to sea. I watched them for a while; when they went on sale I finally decided to splurge and I’m so glad I did. The Land of Nod tent I got for free(!) at the landfill take-it-or-leave-it. That was an incredibly exciting day and one in which I was reminded of the benefits of living in a wealthy area — the things people throw away! 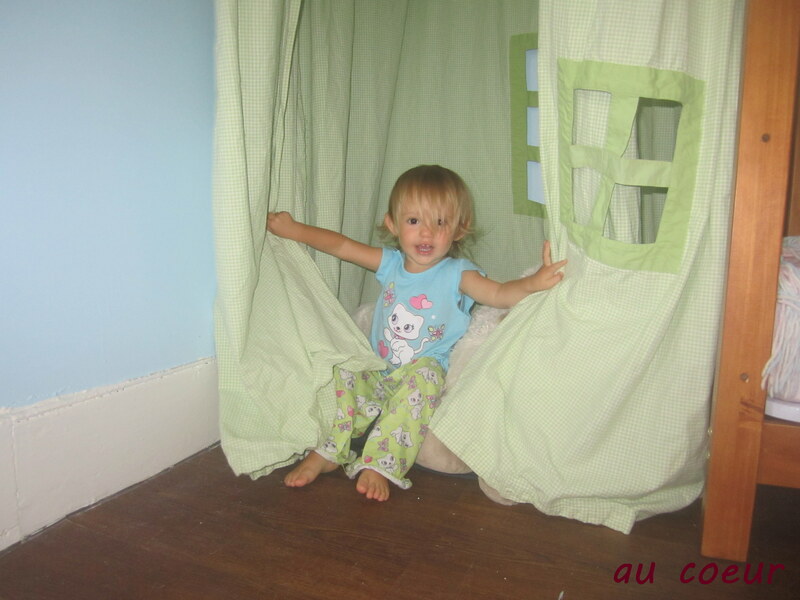 It was the first thing Nora saw when she walked into her room and she spent a good portion of today playing in it. there were three other matching curtains that would have covered more than 12 feet of windows (I can only imagine the house these came from). I paid $5 for the lot of them, put one up on her window and carefully disassembled the rest. I now have yards and yards of extra pink and white stripe fabric and ribbons. If I have time this week, I’ll sew a bed skirt, hamper cover, and a few pillows. I just haven’t decided what I want to do for a comforter/duvet cover. Any thoughts on what would go well? Nora, Just beautiful!!! The room and tent is gorgeous! 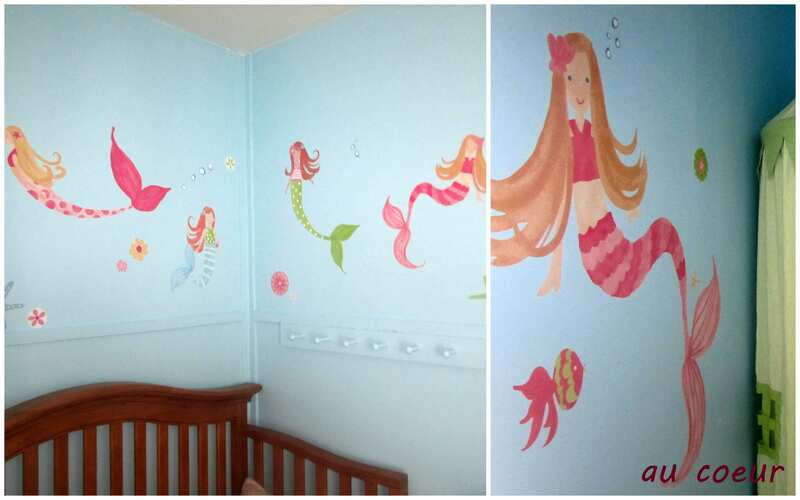 Thank you for sharing the video of your little girl exploring her new room her loving mama decorated for her! yay! it looks so cute! aria got a tent for her birthday and she thinks it’s super funny when people hide in it (it’s made of see-through mesh!) I’m glad you got to bust out some creativity, it’s really pretty. Thanks, Sarah. Nora likes to hide behind things right now too — including our sheer curtains. She also sometimes puts blankets, etc. over her dolls/animals faces and asks where they are. It’s pretty clear that she actually understands that it’s a game, which is really neat.